To be waitlisted for the entire training, or for individual sessions, please inform Mimi Izzo, the registrar: Click here . . . This three-day training intensive will introduce yoga teachers and inquiring students to the practical understanding of the ‘Prana Body’ described in yoga texts in terms of contemporary understanding of the role and function of the fascia — especially as relates to pain syndromes. A central focus from the outset will be on the Core and sacral stability, with attention to taking good care of the sacroiliac joint in all forms of poses, and understanding sacral movement and causes of SI and low back pain — in life as well as in yoga. 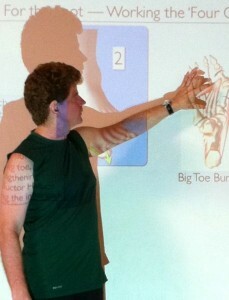 This will also include treatment of patterns of movement linked to pain syndromes that can be ‘rewritten’ through asana practice, as well as the relatively new concepts of the Fascial Distortion Model, which explains the cause of much of our chronic pain in terms of ‘blocks’ in the fascial tissue. The added perspective of the Fascial Distortion Model also will help us recognize the root of “yoga injuries” and pain caused by imbalances in yoga practice — as well as other disciplines of physical movement and sport — that gives rise to or intensifies distortions in the fascia. The description — and its treatment — of fascial distortions is quite similar to the description given by the yogis as well as the Marma-centered disciplines of Ayurveda. The practice of asana is well suited to overcoming these distortions; and by the same token, we can better understand how to address pain arising from ‘yoga injuries’ from extreme actions or misalignments. Three of the six forms of pain-and-limitation-causing distortions are especially relevant and recognizable to us as yoga teachers and practitioners. The training will be an exploration into the wisdom that the ever-evolving practice of hatha yoga has to offer to us in maintaining health and growing in heart in the face of the many challenges — including pain, injury and dysfunction — that life throws at us. This will include an additional focus on working with scoliosis — including both principles for targeted work with scoliosis, as well as insights into how these principles are useful for everyone, since asymmetries that lead to muscular and joint problems are nearly always present, whether one has a scoliosis or not. This will add new dimensions to the practice, including the pairing of intentional breathing to realignment actions in asana. From there we will expand into a treatment of the health of the whole body in the context of Movement Impairment Syndromes at the root of chronic pain — focusing in particular the low back, sacrum, hips, knees and feet. 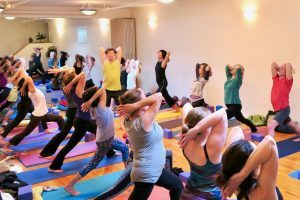 This approach to pain problems is especially suited to yoga, and will provide teachers and practitioners with a vital toolbox for recognizing and assessing these patterns, and designing an approach through specifically targeted asana practice and remedial exercises aimed at changing them for the better. We will finish with an exploration of the breath, exploring ‘openers’ for cultivating space for the breath, as well as toning exercises related to the bandhas for sustaining better breathing patterns. The practice will be carried further into yoga nidra, with some discussion of the significance of the practice of yoga nidra in relationship to our sleep patterns. Each day will begin with a practice, which will give participants a chance to experience how the principles being covered might be introduced simply in the class setting of an asana practice. Each day will also include work with the Vayus, pranayama and Yoga Nidra — including discussion of the principles behind each practice, and some historical background from hatha yoga texts. Each day will finish with a practice that is a combination of yoga nidra and meditation, which will include inquiry into breath and mantra. And through explanation of the process, we will go deeper into its many layers. A detailed manual designed specifically for the immersion will be provided to those attending the entire three day training immersion. High quality recordings of each practice will also be available after the training, to help with review of the materials presented.